Seaweeds are sea-dwelling, simple plants in the nature. They are primitive plants classified under the algae. They lack in various structures that characterize the land plants like leaves, stems or roots. As in fruits and vegetables, they too come in various sizes and shapes depending upon their growing environments. Indeed they are the complex marine macro algae found only in the sea water. Edible seaweed is multi-cellular marine algae eaten raw or cooked in many cultures especially Japanese, Chinese, and other East-Asian regions; while the diaspora now has spread across many continents including Americas carrying their food culture along with them. Almost all the edible seaweeds are salt-water algae, generally grow attached to rock or other hard substance along the coastlines. Brown (Phaeophyceae) seaweeds: They are the most common and large group of seaweeds found worldwide. Laminaria (kombu), and Undaria (wakame) are some of the examples of brown seaweeds. They grow best under cold waters at medium depth. 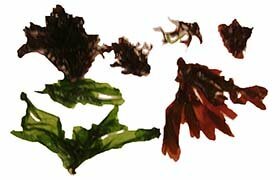 Red (Rhodophyceae) seaweeds: Porphyra (Nori) and Dulse (Palmiria palmata) are the important edible red algae. Blue (Chlorophyceae), and Blue-green seaweeds (spirulina). Brown seaweeds are usually larger in size in comparison to red and green seaweeds. These sea-vegetables are of nutritional interest as they are low in calories, but rich in vitamins, minerals and dietary fibres. Gradually, seaweeds are gaining interest among the health conscious consumers as natural, organic, health benefiting food ingredients. Traditionally, the use of seaweeds as human food dates back to many centuries among the coastal inhabitants in Japan, China, and Korea. In these regions, seaweeds are generally, gathered from the wild although now increasingly cultivated in the supervised farms. Seaweeds play a crucial role as primary producers of food for all marine life. They are rich both in minerals and essential trace elements like iodine, magnesium, selenium, sodium, etc. They considered as sea-vegetables in many countries and consumed for their low calorie but rich vitamins, minerals and dietary fibres nutrient profile. Seaweeds have assumed a greater industrial importance since the beginning of 20th century. They found applications in the production of hydrocolloids; alginate, agar and carrageenan, which employed as thickening and gelling agents in the food processing industry. Seaweeds, which have traditionally been employed by the Western food industry for their polysaccharide extractives "alginate, carrageenan and agar" also contain compounds with potential nutritional benefits. Some seaweed polysaccharides employed by the food industry as texture modifiers because of their high viscosity and gelling properties. In Asia seaweeds have been used for centuries in salads, soups and as low calorie dietetic foods. Biologically active compounds of seaweeds (phlorotannins, carotenoids, alginic acid, fucoidan, peptides) have been demonstrated to play a significant role in prevention of certain degenerative diseases such as cancer, inflammation, arthritis, diabetes and hypertension. Seaweeds traditionally eaten fresh or sundried in Japanese cuisine. While most seaweeds does not call for cooking, some thick fronds of kelp (Alaria) should be boiled efore adding in soups. Being marine produce, seaweeds generally contain high amounds of salt in them. So balance your salt inclusion in the dishes. Seaweeds impart oceanic, fishy, and salty flavor. So too much of seafood at one go may be unappealing for some people. Comemrcially available seaweeds often soaked in water. Nori sheets often toasted before using in sushi rolls. Gentle toasting enhances their flavor. Edible saltwater seaweeds can be safely consumed in small quantities. Unlike, land based food sources, seaweeds tend to absorb and accumulate heavy metals like arsenic, lead, cadmium; and trace elements like copper, iodine, cobalt, iron, etc. Hizikia fusiforme (Hijiki) seaweed has been found to bioaccumulate large quantities of total arsenic (organic and inorganic). The United States Department of Agriculture (USDA) advises against hijiki consumption despite the Japanese Govt reassurance which insists that the consumption of more than 4.7 g hijiki seaweed per day could only result in the arsenic toxicity. (Medical disclaimer). <<-Back to Home page from Seaweeds. Food and Agricultural organisation- A guide to seaweed industry. Arsenic speciation and Risk assessment of Hijiki. Chapter 14 Seaweeds - the United Nations. pdf.